Bulee “Slim” Gaillard was a true character. Self-taught, extroverted, a true globe-trotting hipster before the concept of “hip” really existed, Gaillard’s songs, infectious humor and self-invented jive language (called “Vout”) have not only stood the test of time, but reached something approaching icon status in twentieth-century popular culture. Finding work at ports in the eastern Mediterranean — as far east as Beirut, where he learned some Arabic, he eventually made his way back to Detroit, where he lived with an Armenian family during the early years of the depression. After a stint at boxing, Gaillard trained to become – of all things — a mortician. Soon he was using the funeral home’s hearse to run rum for Detroit’s Purple Gang during the last years of prohibition. While all this was going on, Gaillard was also teaching himself both guitar and piano. He soon set off again, this time for New York. By the late 1930s, Gaillard and his partner, bassist Slam Stewart had a successful nightclub act (called simply “Slim and Slam”) featuring silly songs, jive patter and comedy that bordered on the surreal. After recording several novelty hits, including the immortal “Flat Foot Floogie with the Floy-Floy,” they released a string of records and appeared in the 1941 film “Hellzapopin.” World War II effectively ended the act by drafting the pair into the military, where Gaillard ended up in the Air Force flying B-26 bombers in the Pacific! With all these changes in both vocation and location, he never gave up on his music. Gaillard continued to make records; one-off sessions that yielded 45rpm singles that he would distribute to radio stations in the hopes of scoring regional hits. 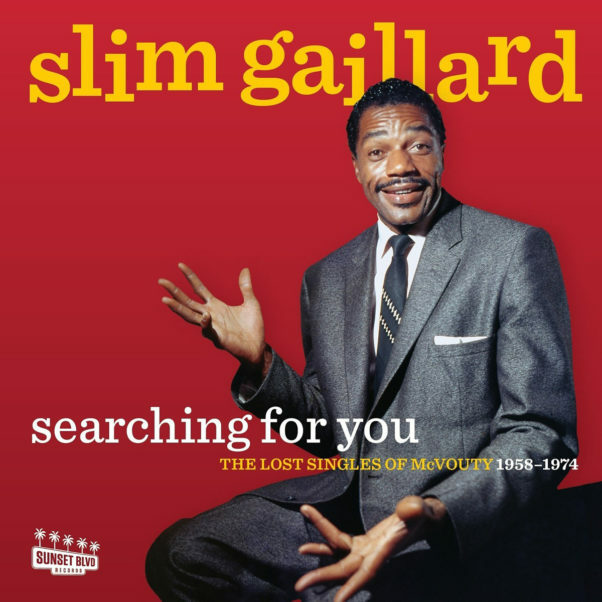 Many of these unknown recordings have finally surfaced in the collection Slim Gaillard — Searching for You: The Lost Singles of McVouty 1958-1974 (Sunset Blvd 7905). Gaillard always had a fascination with food, and this album features several culinary tunes. “Cha Cha Enchilada,” “Baked Beans and a Bottle of Beer” and “Frim Fram Sauce” (previously a hit for Nat King Cole) are a full meal in and of themselves, but can always be washed down with a shot of “Kahlua”. The classic “Flat Foot Floogie” gets an early ‘60s surf music treatment, as does the original “Dr. Free.”It’s all very campy, very funny and very Slim Gaillard. All of the songs in this collection are very well produced with full bands, backing vocals and production values, which makes one wonder who’s deep pockets were financing these sessions. It’s impossible to say whether these singles played a part in Gaillard’s resurgence during the 1980s, when his friend Dizzy Gillespie got him a spot in the Newport Jazz Festival in ‘82, but that festival appearance led Gaillard to yet another globe hopping period playing festivals throughout Europe in the next several years. After determining that “Everything’s OK in the UK” as he says in the BBC documentary “Slim Gaillard’s Civilization” (available on YouTube) the world traveler seemed to have finally found a home in London, England ­ searching no more.